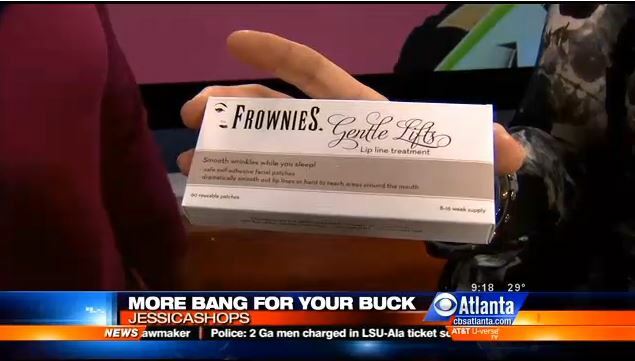 Congratulations to our Client Frownies for their feature on CBS Atlanta. Frownies Facial Patches are an effective wrinkle treatment that addresses the physical cause of deep lines and wrinkles on the face. Frownies Facial Patches are made from natural, skin-friendly materials and work to give a younger appearance. Simply apply the facial patches to the forehead winkles between the eyes and across the forehead as well as the crows feet at the corners of the eyes and around the mouth, to gently re-educate the underlying muscles to assume their correct, relaxed and natural appearance. Frownies, traditional patches work at night to eliminate the appearance of skin wrinkles, leaving younger, relaxed-looking skin. A true anti-aging skin treatment! Check them out at Frownies.com.